Project manager Miton Clayborn leads an orientation session at SLATE's offices in downtown St. Louis. Participant Sequoi Edwards sits on the right. Edwards hopes the training will help him run a youth-centered nonprofit. 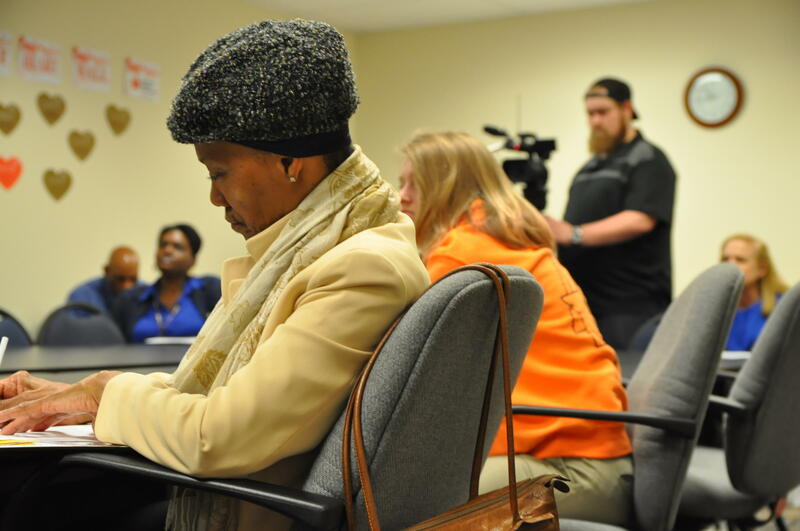 Ten people, mostly women, sat around a table at the St. Louis Agency on Training and Employment (SLATE) on Wednesday to learn more about these first-of-their kind apprenticeships. The two-year program includes five weeks of classes, paid on-the-job training beginning at $9.50 an hour, and placement at an early childhood education program with pay scaling up to $13 an hour. Participants will graduate as Child Development Associates with a certification from the U.S. Department of Labor. Funds from SLATE will cover half of each apprentice's pay and the $425 fee to take the credentialing exam, said Miton Clayborn of the LUME Institute, who will teach the classes. Forty-five people have attended the orientations, Clayborn said. To participate, applicants must have a high school diploma or GED and pass a series of work-readiness assessments. The first 15 students will start as soon as mid-May. A participant fills out paperwork during an orientation session for the new apprenticeship program. One of the grants funding the pilot program is reserved for residents of the Clinton-Peabody public housing development south of downtown; eight residents have expressed interest so far, coordinators say. Single women head 92 percent of the households in the development, and average income is just over $7,200 a year, said St. Louis Housing Authority director Cheryl Lovell. “When we asked people what their career interests are, child care is in the top three or four. It’s probably because many people have experience taking care of children,” Lovell said. More traditional apprenticeships geared toward plumbers, electricians or construction workers were less popular, Lovell said. Given the interest from the residents and that local programs report difficulties finding qualified new hires, training people to work in early childhood centers simply made sense, she said. Dawn Winkler, who directs an association of St. Louis day care centers called United 4 Children, said centers often struggle to find qualified employees who are willing to work for the wages they can afford to offer. According to the Bureau of Labor Statistics, the average hourly wage for day care workers is $10.72, or $22,310 a year.